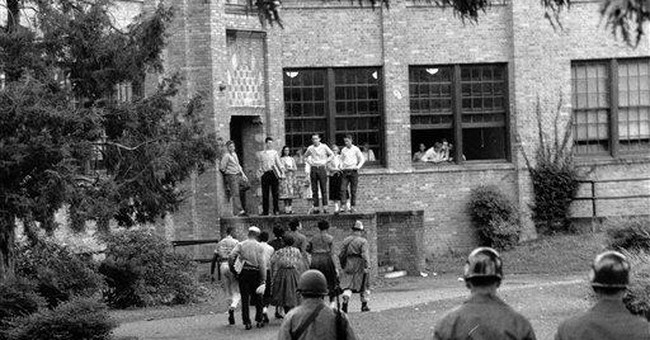 Next week brings the 50th anniversary of the desegregation at gunpoint of Central High School in Little Rock, Ark. The U.S. Supreme Court had unanimously struck down in 1954 the concept of "separate but equal" education, and three years later the school became educational desegregation's first major battlefield: Nine black students tried to enter the all-white institution on Sept. 3, 1957, and were turned away. Looking back now, the end to government-required segregation seems inevitable, but 50 years ago support for it was widespread. Arkansas Gov. Orval Faubus helped to orchestrate the mob demonstrations that kept the students from entering the school. To keep the mob at bay President Dwight Eisenhower had to decide whether to send in troops to take action, potentially severe, against American citizens. Here' s where personal experience becomes important, as Kasey S. Pipes relates in "Ike' s Final Battle: The Road to Little Rock and the Challenge of Equality." Pipes describes Eisenhower's tough decision regarding Little Rock as the culmination of a racial education that began during World War II's Battle of the Bulge. That's when Ike searched for more soldiers and found them among the 300,000 African-American troops who, by War Department policy, were driving trucks and working in the kitchens. Eisenhower, Pipes told me, "offered them the chance to be trained and sent to the front. Thousands jumped at the chance. Though the Bulge ended before they were ready, they fought in later battles. Ike was impressed with their courage. He never saw race the same way again." And 13 years later, instead of considering blacks fit only for lowly tasks, he thought they should all receive the best education their local school districts could offer. Eisenhower's religious beliefs also made a difference. He grew up attending church and then drifted away for a while, but as president he often spoke of God in speeches. Pipes: "He famously pushed for the inclusion of the words 'under God' in the Pledge of Allegiance. In some ways, he saw his journey on race as a journey of redemption. When a black aide confronted him about derogatory comments he had made years earlier about integrating the Army," Eisenhower asked for forgiveness. But Eisenhower didn't want to set the bad precedent of the federal government poking state governments with bayonet points. He met with Faubus and asked him to use National Guard soldiers under state control to keep back the mobs. Only when Faubus wouldn' t do so did Eisenhower, on Sept. 25, send in the 101st Airborne Division. Democratic Sens. John F. Kennedy and Lyndon Johnson criticized the move, but the 101st set up barriers and patrols, and the crowds eventually went home. The Little Rock result had a lasting effect. As Pipes says, "Little Rock guaranteed that integration would prevail. No one could doubt that the federal government had the power to enforce it . . . . the greatest impact was on the civil rights movement itself. Little Rock proved that integration would be enforced by the federal government even at the point of a gun. Dr. Martin Luther King Jr., though outraged by the mob violence, called Little Rock a 'blessing in disguise.'" That blessing also brought a curse: the expansion of federal government power that led to the not-so-Great Society of the 1960s and to forced busing that, sadly, led many families to leave urban school systems: The federal government (and some federal judges in particular) went from fostering integration to requiring it, so that what initially enabled free movement soon turned into court-mandated overrides. Nevertheless, Eisenhower deserves credit for working to advance the American experiment of e pluribus unum, an impossible mission according to most cultures in world history. He also deserves credit for understanding that he was creating a troublesome precedent -- but since man' s expulsion from the Garden of Eden, mixed results have been our lot.